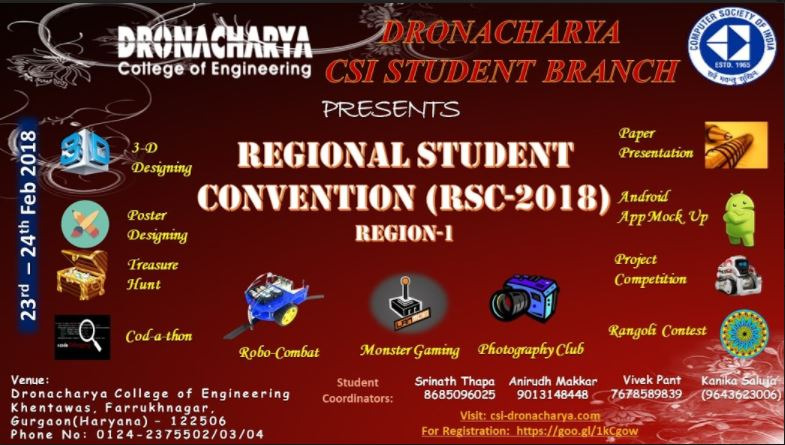 CSI Regional Student Convention 2018 RSC 2018 is being organized by CSI Gurugram Chapter and Dronacharya College of Engineering, Gurgaon during 23rd - 24th February 2018. The Theme for the Convention is “Advancement in Technology and Real Time Challenges” (ATRTC-2018)”. ATRTC-2018 is a platform for sharing ideas and expands networking for scholars, researchers, and students from all areas of Science, Technology and Innovation for Inclusive and Sustainable Development. The main aim of Regional Student Convention is to build a foundation and inspire the young students of engineering to understand and apply the new trends in technology. The convention targets to give a broad overview of Technical Fusion. Also, it invites students to participate in the various events. As a Professional body, CSI encourages and supports R&D Projects in various branches of Engineering and Technology. At the same time, it is responsible to sponsor the participation of Indian IT Professionals at the conferences, workshops, symposiums, conventions of National and International Platforms.